(Nanowerk News) An international team of scientists have observed how a mysterious quantum phenomenon in organic molecules takes place in real time, which could aid in the development of highly efficient solar cells. The researchers, led by the University of Cambridge, used ultrafast laser pulses to observe how a single particle of light, or photon, can be converted into two energetically excited particles, known as spin-triplet excitons, through a process called singlet fission. If singlet fission can be controlled, it could enable solar cells to double the amount of electrical current that can be extracted. In conventional semiconductors such as silicon, when one photon is absorbed it leads to the formation of one free electron that can be harvested as electrical current. However certain materials undergo singlet fission instead, where the absorption of a photon leads to the formation of two spin-triplet excitons. Working with researchers from the Netherlands, Germany and Sweden, the Cambridge team confirmed that this ‘two-for-one’ transformation involves an elusive intermediate state in which the two triplet excitons are ‘entangled’, a feature of quantum theory that causes the properties of each exciton to be intrinsically linked to that of its partner. 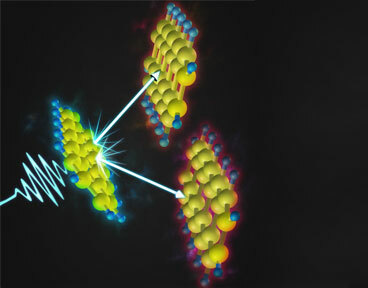 By shining ultrafast laser pulses – just a few quadrillionths of a second – on a sample of pentacene, an organic material which undergoes singlet fission, the researchers were able to directly observe this entangled state for the first time, and showed how molecular vibrations make it both detectable and drive its creation through quantum dynamics. The results are reported in the journal Nature Chemistry ("Real-time observation of multiexcitonic states in ultrafast singlet fission using coherent 2D electronic spectroscopy"). The key challenge for observing real-time singlet fission is that the entangled spin-triplet excitons are essentially ‘dark’ to almost all optical probes, meaning they cannot be directly created or destroyed by light. In materials like pentacene, the first stage – which can be seen – is the absorption of light that creates a single, high-energy exciton, known as a spin singlet exciton. The subsequent fission of the singlet exciton into two less energetic triplet excitons gives the process its name, but the ability to see what is going on vanishes as the process take place. To get around this, the team employed a powerful technique known as two-dimensional spectroscopy, which involves hitting the material with a co-ordinated sequence of ultrashort laser pulses and then measuring the light emitted by the excited sample. By varying the time between the pulses in the sequence, it is possible to follow in real time how energy absorbed by previous pulses is transferred and transformed into different states. Using this approach, the team found that when the pentacene molecules were vibrated by the laser pulses, certain changes in the molecular shapes cause the triplet pair to become briefly light-absorbing, and therefore detectable by later pulses. By carefully filtering out all but these frequencies, a weak but unmistakable signal from the triplet pair state became apparent. The authors then developed a model which showed that when the molecules are vibrating, they possess new quantum states that simultaneously have the properties of both the light-absorbing singlet exciton and the dark triplet pairs. These quantum ‘super positions’, which are the basis of Schrödinger’s famous thought experiment in which a cat is – according to quantum theory – in a state of being both alive and dead at the same time, not only make the triplet pairs visible, they also allow fission to occur directly from the moment light is absorbed.